The Southfield Hodgson’s were still keen to go to America. After the end of the war, two more of Teddy and Mabel’s children – Hortense and Linton – were in America. I have no details of their Journey or the exact date they travelled or arrived. If any family members have these details, please drop me a line and I will re-write and update this blog. Leslie Hodgson was living at Southfield Pen Great House with his wife Phyliss, raising their three children, Ralph, Ainsley and Shirley. John Hodgson, unmarried, had found work in the capital, Kingston and was living at 6 Drummond Street. Cecil may also have been in Kingston too or maybe even at Southfield. Hortense and Linton joined their other family members in New York. Hortense married, Jamaican Terrence Parris when she was about 27. incidentally, Terrence’s brother was Dr Parris, a man who worked in the Kingston, Jamaica passport office and was responsible for approving all Jamaican’s intending to emigrate to the United States. Could this have been how Hortense and Terrence met? The following year, Hortense’s brother Linton would also marry in the States. A very upsetting event happened. George Burkley, Mae and their three children, Lorrelle, Glenna and Orville were living at Manhattan, 276, West 153rd Street. Their home was broken into with many items being stolen. They were devastated, but what upset Mae the most was the theft of her beloved jewelry box that contained a gold brooch with a lock of hair encased inside it. This had been handed down to Mae at Southfield and taken to America when she emigrated there in 1923. Mae was very distraught and inconsolable about losing this family heirloom. Momma cried and cried for a long time about losing that brooch. We have to go back to Southfield in the early 1900’s to learn about the Lock Of Hair…. Mass Teddy’s parents were all living in a shop down the hill at Lower Southfield. Also living with his parents at the shop was the sister of Mass Teddy’s father, Mass Ned. Her name was Frances Amelia Hodgson. She was fully white and known to Mass Teddy and his family as Aunt Fanny. Sometime after the death of her brother Ned in 1912, Fanny moved out of the shop and went to live up the hill at Southfield Pen Great House with her nephew Mass Teddy. She lived there with all his family working as a seamstress. Fanny had a very comfortable bed at the shop, it was a big four-poster which she took with her to Southfield Great House. This Mahogany bed had been made 1895 in England. It had to be fully dismantled and then re-assembled to get it through the doors at the Great House. Fanny was no stranger to the Great House, having been born at the ‘original thatched Great House’ in 1841. When Fanny moved in to the old home, she and her great neice, Mae slept in the feather bed. I would imagine Fanny told Mae all about the Hodgson’s wealthy past. They would have talked a lot and become close. In 1922 – just a year before Mae emigrated to America – Aunt Fanny died. Mae then took possession of her treasured gold brooch containing the lock of hair that she cared so much about. Mae took the brooch and it’s jewelry box with her to America. It meant a lot to her. Aunt Fanny and Mae both slept in the ‘feather bed.’ Hortense was the next to use it. Who’s Lock Of Hair Was Contained Inside It? To find the answer to this question, we go back to 1841. The gold pin brooch could be worn on a high neck blouse. It contained a brownish or blond lock of hair and carried the name …….. Chisholm inscribed on it’s back. This was most certainly the hair of the mother that Fanny never knew. Her mother had died at Southfield just 10 days after giving birth to her. It could be worn on a high neck blouse. It was handed down in a jewelry box. It had the name Chisholm on the back. The hair was brownish/blondish. The maiden name of Fanny’s mother was Margaret Chisholm. She was also the mother of Mass Teddy’s father Mass Ned. 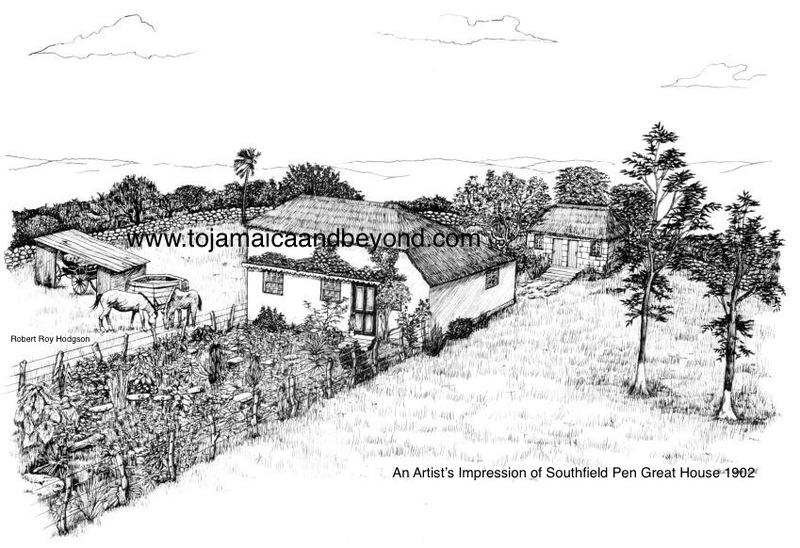 The Chisholm’s, were very rich and powerful and owned Southfield Pen Estate in the mid 1800’s. An old tradition used by the wealthy when a loved one had died, was to cut out a lock of hair from the deceased and preserve it in a gold locket as a keepsake for the family or children.